Anaconda, Godzilla and now Ragnarok, Hollywood loves large monsters. 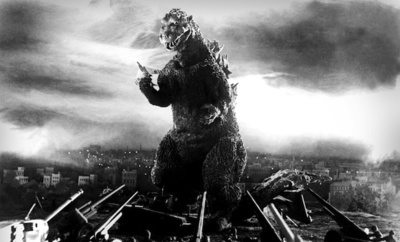 What do you think, have giant monster movies had their day, or would like to see more? In case you’re interested, I’ve added the Ragnarok trailer below. I haven't seen the new Godzilla yet! I'm normally not into big monster movies, but I really want to see this one, if only to see David Strathairn. He was so good in the show Alphas. I really miss that show. Admittedly, this is one sub-genre that I've been happy to stay away from in the past. That may all change with the new Godzilla movie though. I think special effects have finally reached a level where we can do these types of movies justice. And that makes sense to me, I have no issue with all the cheese and old school pomp in Godzilla movies. There is a tradition there, and current effects are making the cheese actually look much better than it used to which is kind of funny in its own way. The issue I take is with the cheesiness in Godzilla knock-offs like Anaconda. I haven't actually watched any Hollywood monster movies, but I am familiar with some of the plots and iconic scenes. I think monster films have a cool retroness to them, that risk being cheesy if tried to be reproduced these days. But the greater the risk, the greater the gain. Such films have an equal chance of being big hits.